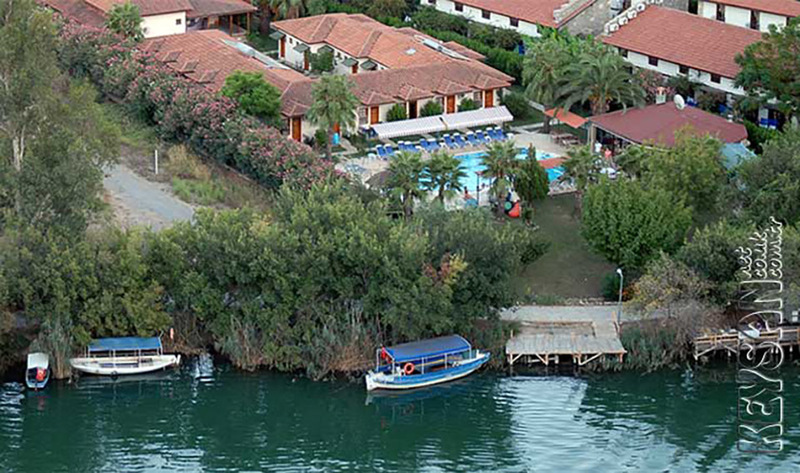 If you are planning a travel to Dalyan and looking an accommodation for you and your family and whatever the size of your party or family, we are sure you will be find an accommodation here suited to you in Dalyan. This delightful, intimateKeysan Yunus Hotelis set right on the riverside, with beautiful views to the forest and a backdrop of dramatic mountains in Dalyan. The Keysan Yunus hotel has well-kept gardens with a variety of roses and other flowers, surrounding the patio area. You can relax on a hammock in the gardens or sunbathe around the pool with a refreshing drink from the bar.It is easy to while away the hours on the riverfront, just watching the boats as they sail back and forth, or relaxing with a book.The 23 air-conditioned rooms are bungalow style, built in a horse-shoe shape. Each ground floor room has a terrace balcony either looking towards the pool and river, or towards the gardens and mountains. Freshly prepared home-cooked food is served nightly in the vine-covered patio area by the river.Snack are available throughout the day. They have been tastefully refurbished and decorated in 2006 and each has private en-suite facilities with hairdryer, direct dial telephone. Wireless internet connections also available by the swimming poll and bar area. A charming, friendly family run hotel in an idyllic location, right on the riverfront. Once you had the Keysan Yunus Hotel experience,you will want to return year after year,as so many of our guest do.